Chelsea’s all time second highest goalscorer, only three shy of first, was given rest for Thursday night’s Europa League second leg against Sparta Praha and rightly so. Before the Sparta game he plied his services for the team in every game in this 2013 year. And keeping the Manchester City game in mind, he was rested. But his presence on the pitch was vastly missed in that Sparta game. If you watch the games regularly you would be forced to believe that Frank is our midfield maestro. There are many qualities that singles him out of everyone. His passing, positioning and timing is just fascinating. Its true that the likes of Hazard and Mata are better at the talents and skills part, but none is better than Lampard in leading and character. Frank is the organizer of our whole team. He not only positions himself on the pitch but tells others where to be and what to do. If you observe him closely while he plays you would notice that he is always looking side to side, looking everywhere. He is like scanning the whole pitch and then calls on to others and tell others where to be. In football, we see players makes mistakes in positioning themselves, failing to decide what to do in certain situations. What we see in Frank is rather special. Anyway, if you are thinking of indulging yourself in betting, you should do you research. Look up the stats of the teams playing and be sure to check the sports betting lines at Topbet.eu from time to time before you make any betting decisions. It was obvious that our midfield was a mess in the major parts of the game against Sparta Praha. The opponents were dictating the midfield and were making slick passes, only because our players’ positioning in certain situations was not good enough. Now don’t get me wrong here. I’m not implying that the rest of our squad is not efficient. Our players are talented and skilled. They can understand how games go on. What I am implying is that Frank is better in guiding our team because of his experience and if Frank is on the pitch, it is a major advantage for the other players because he always tell everyone what to do. He is the manager on the pitch. Many coaches and many footballing experts have praised Frank for this quality. We see a very unique character in him. This maybe his last season for him at Chelsea. If we lose him, it would be a great loss for us. And if he joins some other Premier League team, it would be an even greater loss because that team would gain what we had lost and we will have to play against him. Now, I’d never want to see that happen. Chelsea are being linked with a summer swoop for Bayer Leverkusen’s Stefan Kiessling as the Blues search for a new striker. No matter who is in charge of the club next season, at least one new striker will be heading to the club as doubts surround the future of the mis-firing Fernando Torres. Even if the Spaniard stays, Chelsea need more competition up front despite the January arrival of Demba Ba and reports claim that Kiessling is a target. The 29-year-old is the leading goalscorer in the Bundesliga this season with 15 goals in 22 games but he could be on the move for as little as £6million as he looks to force a move away from the club. Kiessling saw a January move to West Ham collapse but reports now claim his agent has been in touch with Chelsea in an attempt to line up a close-season deal. Chelsea starting XI vs M’Boro FA Cup 2013:- Cech, Ferreira, Ivanovic, Terry, Bertrand, Ramires, Ake, Moses, Oscar, Benayoun, Torres. 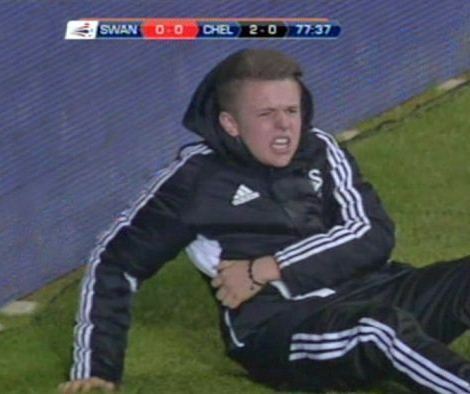 In a major talking point during Chelsea’s 0-0 draw with Swansea on January 23, 2013, the Blues’ Belgian playmaker Eden Hazard was sent off by referee Chris Foy for kicking a teenage ball boy, identified as seventeen year old Charlie Morgan, in the ribs. Came across this comic strip which might appeal to sports fans. See their one on the infamous "ball boy" incident! The incident took place in the 78th minute of the game, with Hazard seemingly incensed at the ball boy’s delay in returning the ball to action. He later said that he was only trying to retrieve the ball, but apologised to the boy, whose father has decided not to press charges. Two cracking long range screamers, both scored in the first half, help Lazio down Pescara 2-0. Pescara starting XI vs Lazio 2013:- Pelizzoli, Balzano, Cosic, Bocchetti, Capuano, Zauri, Rizzo, Cascione, Bjarnason, Abbruscato, Celik. Bale’s 90th minute second goal was a bit Ronaldoesque as he gave Jussi Jaaskelainen no chance in the Hammers goal. Bale had also scored the first goal of the game, a good finish in the 13th minute. This Papiss Cisse goal vs Southampton saw the Senegalese forward produce another strike of incredible quality in a Newcastle jersey. Cisse’s goal v Southampton helped Newcastle beat Saints 4-2 at St James Park on 24 February 2013. With the game evenly poised at 1-1, Cisse struck a beautifully dipping volley after Newcastle keeper Elliott had launched the ball forward from the Magpies’ half. French giants Paris Saint-Germain have taken a big step towards re-branding by unveiling a new logo that will be used beginning the 2013/14 season. The logo change was announced by PSG on February 22, 2013 and features some radical changes, such as the disappearance of the cradle and the year 1970 ( the year the club was formed). While the old logo had Paris Saint-Germain written on top of the Eiffel Tower, the new logo has only Paris written on the top, with Saint-Germain moving to the bottom. The font of Paris is also larger than Saint-Germain, with a difference also being made in the shade of blue used in the logo. Below is the new logo, followed by the old one.